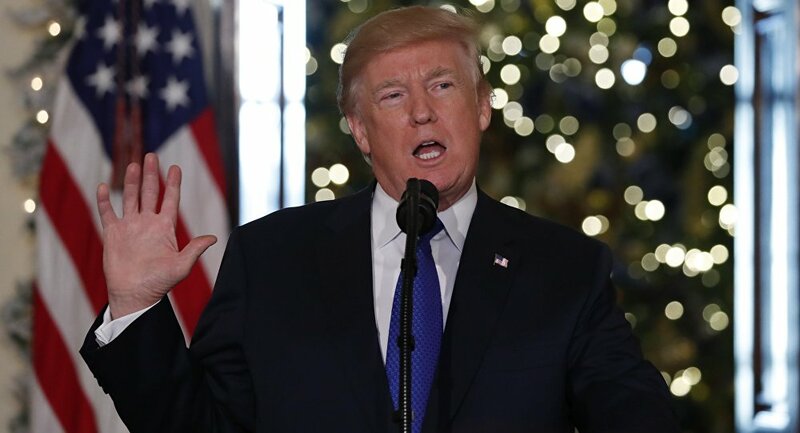 US President Donald Trump is expected to present his "America First" national security strategy on Monday, with the White House arousing the public’s curiosity by publishing excerpts of the document. The US President Donald Trump is expected to declare Russia and China political rivals, aiming to challenge US power, security and prosperity in his new national policy blueprint, which has been in the works for months by the president and his top advisers. "They are determined to make economies less free and less fair, to grow their militaries, and to control information and data to repress their societies and expand their influence," Trump's national security strategy reads, according to extracts released by the White House. According to a senior US administration official, the document identifies these countries as revisionist powers, as Moscow and Beijing exert efforts to "change the status quo." "Revisionist means basically powers that are seeking to change the status quo, so that most people would argue that Russia’s invasion of Ukraine, Georgia, those activities sought to change status quo in Europe in a generally non-positive direction nor a peaceful direction … Essentially also with China building up in the South China Sea, they’re trying to change the status quo," the representative of the US administration added. The strategy outlines the major threats facing the United States, as well as the administration's plans to address them. "We also identified three major groups of challengers – the first are revisionist powers … the second are rogue regimes that spread terror, threaten their neighbors and pursue weapons of mass destruction, destabilizing critical regions, the third is transnational threat organizations that foment hatred, incite violence against innocents in the name of their wicked ideologies," the official told reporters Sunday. According to the passages released by the White House, Washington will reconsider its policies on the assumption that including competitors in international institutions "would turn them into benign actors and trustworthy partners." While Russia is yet to respond the strategy, Chinese Foreign Ministry's spokesman Hua Chunying has reacted to the upcoming release of the document during a regular briefing, urging Washington to promote "strategic mutual trust." "We hope the US national security strategy will play a constructive role to promote world peace and stability and contribute to Chinese-U.S. strategic mutual trust in ensuring world peace and security," Hua said. The document will name North Korea's missile threat, Iran and Islamist militant groups as the main challenges. "As missiles grow in numbers, types, and effectiveness, to include those with greater ranges, they are the most likely means for states like North Korea to use a nuclear weapon against the United States. North Korea is also pursuing chemical and biological weapons which could also be delivered by missile," the document's citations read. Despite the recent Pentagon's statement, claiming that North Korea's missiles are not capable to reach the US territory at the moment, Washington repeatedly calls Pyongyang's nuclear missile development program a consistent threat. The statement was made in the wake of North Korea's November 28 test of the Hwasong-15 intercontinental ballistic missile (ICBM), which has reportedly failed. Pyongyang has commented on the test by saying that it has completed its "nuclear force" with the development of the Hwasong-15 ICBM and claiming that the operational Hwasong-15 could reach the US mainland, which was confirmed by South Korea's military. Trump is fulfilling the promises he made during the presidential campaign by demonstrating an "America First" stance within the whole document, putting the protection of the country and its borders, military rearmament, extending power abroad and the country's trade policies among the key priorities. However, the document recognizes the need to find areas of cooperation with the country's specified competitors. "This strategy prioritizes America’s interests and acknowledges that we must compete, and I think you’ll see this throughout the document that we do live in a global competition and how we advance our goals is more critical than ever. One of the ways that we advance them, obviously, is to find areas of cooperation with our allies, our partners and sometimes with our competitors," the official told reporters. The official stressed that the strategy reflected Trump's vision of the world, "free with sovereign nations with diverse cultures, different aspirations that respect the interests of their own people and the rights of those sovereign nations to do so, while finding ways to promote America’s values as well as the example principles that we believe distinguish the United States." The long-awaited new strategy avoids repeating Barack Obama's stance on the environment, with his 2016 description of climate change as the pivotal threat to US national security. The current occupant of the White House maintains a skeptical position on the issue, having withdrawn from the Paris climate agreement, signed by his predecessor. "We don’t use the term pre-emption in the strategy, we talk about our right to defend ourselves as a country," the official stated. The US Congress has required successive US heads of state to provide it with papers defining their plans for national security since 1986, with the latest issued by then President Barack Obama on February 6, 2015.